Facts on asphalt emulsions - GlobeCore Bitumen Emulsion. Asphalt emulsions in India supports cold mixing; it is comprised of a mix of bitumen with water. The emulsion is fluid at ambient temperature, therefore heating is not necessary in its infusing, which a rather delicate process that ensures that the emulsion does not separate into its components, that is, bitumen and water, until it is applied on the pavement surface There are numerous grade combinations available for full mix before application by means of a replaceable spray bar. Light “folding” ensures that the asphalt emulsions in India covers the stone surface without breaking. The material is used for creation of binding layers, top coats and wear layers for all but the roads with the highest traffic loads. The cold mix material can be applied in exactly the same manner as the hot material, by a paving machine, although it is the rolling which follows that is particularly important in regard to the function of the asphalt emulsions by Bitumen in India. The special cold mix based on emulsion and other ingredients are compacted by a combination of vibration and pneumatic tire rollers, causing the emulsion to separate, precipitating bitumen while the water evaporates. It is a usual practice to allow traffic on new cold mix asphalt immediately after laying, but the combined mix gains strength with time. Once the layer is in place, it looks and performs differently from the hot mix, which is one of the causes that such process has not been applied as much as it might have been. A frequent error is to evaluate cold mix with the methods appropriate for the other mix type, the hot mix, which do not offer the performance of the cold mix. Factors typically contributing to efficiency are rigidity and void content, both of which are not true measures of the cold mix layer performance. Attempts are being made to alleviate this by combining the cold mix production process with such methods of evaluation that could, in the future, become the base of newly developed specifications. The other key obstacle to the increased use of cold mix is money. Many contractors invested large amounts into the hot mix industry, and they naturally desire to maximize their returns, naturally hindering the application of cold mix. The transition from hot to cold mixing offer significant reductions in both energy consumption and CO2 release, since the amount of energy needed for processing of the materials in cold mix is insignificant compared to that of the hot mix process. A typical fuel requirement to make 1 ton of cold mix asphalt is 0.1 liter, while the same for hot mix is anywhere between 10 and 14 liters. Asphalt emulsion based cold mix allows for much higher portion of recycled materials to be included in the mix, compared with hot mix. It is even possible to efficiently make a cold mix binder layer using RAP for the combination. Emulsions can also be applied to surfaces infected with tar. Cold mix asphalt emulsions in India supports cold mixing; it involves coating of the aggregate with bitumen emulsion with water. Usually, the emulsion is a liquid at room temperature, and does not require a source of heat for mixing. It is important to maintain process parameters carefully so as to avoid emulsion separation into the basic components: that is, bitumen and water, until the emulsion contacts the pavement. Special plants for cold mix production allows to prepare various kinds of emulsions, when different grades of aggregate are mixed before application of the binder through the spray bar. In the careful process, the emulsion then coats the stone material without breaking. Emulsion can be used to make binder layers, overlays and to repair practically all roads, with the possible exception of roads with extremely high traffic loads. 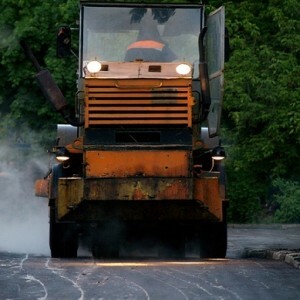 Application of cold grade asphalt is virtually the same as application of hot asphalt: through a paving machine. However, the rolling after the application is important to the future function of the material. The mix, specifically made of emulsion and additive components is compacted with vibrating compactors or pneumatic tire rollers, causing the emulsion to break down, bringing bitumen to the surface and evaporating the water. It is perfectly normal to allow traffic on a cold mix road top right after its application, however, the material improves with time. When the material set, it is different form hot mix in the way it looks and functions, which is one of the causes this material has been seen wider use so far. Often, wrong criteria and methods of mix evaluation are used for cold mix, which may be suitable for hot mix, but do not show the cold mix at its best efficiency. Asphalt mix is often evaluated by elasticity and void content. None of these factors is a correct measure of cold mix performance. This is being tackled by improving mixture composition and developing evaluation methods which will form the basis for future cold mix specifications. There is, however, another obstacle to the wide spread use of cold asphalt mix. Many contractors have invested enormous finances into hot asphalt mix plants. It is only natural that they expect return on their investment and are reluctant to consider using cold mix in their operations. The transition to cold mix reduces the consumption of energy and emission of CO2 drastically: the energy needed to heat cold mix components is quite insignificant compared to the energy consumption of hot mix production. Only about 0.1 liters of fuel is consumed for 1 ton of cold mix – compare with the whooping 10 – 14 liters of fuel burned for 1 ton of hot asphalt mix produced. There is yet another motivation to use cold mix, and that is the requirement to use more and more Recycled Asphalt Pavements, or RAP. Cold mix asphalt emulsions demonstrate the ability to integrate a much higher ratio of recycled material into the mix than hot mixes do. It is entirely possible to make a cold mix binder layer efficiently using RAP only. Asphalt emulsions can also coat surfaces contaminated with tar.